Pricing for Silent Disco Rental is typically determined by the number of guests, which of course, is the number of headphones that you need. Here at www.Silent-disco-rental.com, your rental rate is $7.00 per headphone for the first 100. We include the transmitter equipment, chargers and adaptors for no additional cost to you. We include round trip shipping for no charge. So the math is easy. If you have 100 guests, your price for rental is 700 dollars. Okay, so if you have 63 guests, you are still going to need a calculator, but at least you don’t have to add on additional fees. Here are a few round numbers calculated for you, so you can get an idea of your prices for your party. And it keeps going at the same rate, but you get the idea. There is a security deposit to cover loss and damage. That is not a real cost because it is returned to you once the equipment comes back in good shape. Note that we only offer one type of headphone. They are premium FM frequency, battery powered (10 hours operation), three user selectable channels of music with LED’s that change color according to which channel the headphones are receiving on. We only offer one type of premium transmitter. They transmit FM quality music for a football field of distance and are already wired and set-up when you get them. So, there is zero assembly required. We would love to help you make your next party be your best ever! Providing entertainment for a Bar/Bat Mitzvah party is a huge challenge for a DJ with a traditional loudspeaker powered sound system. Every time I am the DJ for Bar and Bat Mitzvah parties, I am struck by the difficulty of pleasing the 13 year old guests at the same time as pleasing their parents and grandparents. With a traditional sound system, they all have to hear the same thing. The problem is that they don’t want to hear the same thing. If you haven’t been to one of these parties, let me describe the challenge. The Bar or Bat Mitzvah party usually happens near the child’s 13th birthday and they invite their friends from school. So you get anywhere from a dozen to three or four dozen kids close to that age wanting to hear their music. Of course this is a family event, so the parents invite their friends and extended family which includes the grandparents and the grandparent’s friends who want to talk and dance too. The DJ is trying to please three generations simultaneously. When was the last time you heard grandparents getting excited over the music choices of their grandkids? And when was the last time you heard them agree on how loud the music should be? It starts with only teens on the floor. Then the grown-ups demand a few songs. The teens complain and clear off the floor while the DJ works to get the grown-ups dancing. When the adults are finally filling the dance floor, the teens are demanding a few songs. Then the grown-ups complain and clear off the floor and the cycle starts all over again. The cycle continues throughout the night with the end result that none of the generations are really being satisfied. Think of the poor parents that are paying for it all! They are stuck between the teenagers and the senior citizens. One side is begging for the music to be turned down and the other side is begging for it to be turned up. Both sides are begging for the DJ to play something they like. Usually the parent’s generation is pretty tolerant, but the teenagers and the senior citizens are threatening a mutiny! Grandparents and teenagers are the age groups that have the strongest preferences for their own music and how loud it should be played. They are also the two most vocal age groups when they feel their preferences are being ignored. It is as if in a dream. Each generation is shouting at the DJ, waving their fists and threatening violent retaliation. Suddenly the lights flicker and go out with a flash of sparks. Everyone is frozen in shock! There is a crash of thunder a blinding light appears above the combatants heads! Is it the miracle we’ve been praying for? Yes, It is! A host of heavenly angels begin singing as a diamond studded pair of headphones slowly descend from the heavens. Then there is another, and another, and then the air is full of headphones! Sparkling beams of light splashing everywhere as they slowly settle down over the ears of every guest! The lights come back on and everyone is wearing Silent Disco headphones. Everyone is smiling and everyone is happy once again! The solution is sooo simple! #1) What do the grandparents want? They want the music to be soft enough that they can talk and they’d prefer oldies tracks! #2) What do the parents want? They want the volume to be such that they can either dance or talk and they want to hear music titles that they recognize. #3) What do the kids want? They want the music nice and loud and they want to hear their brand new tracks from their teens-only sources! Our headphones allow the user to choose between three channels. So, have your DJ broadcast three different genres of music; one to each channel. You’ll need an oldies playlist for the grandparents’ generation, a top 40 (both new and old) playlist for the parents’ generation, and of course a teens’ playlist for the kids. Each set of headphones has their own volume control, so everybody is happy with the volume. Long conversations at this type of event work best with some background music always playing on a traditional sound system. I recommend using the traditional sound system for the announcements, the hora (chair-lifting) and spotlight dances using the regular sound system. Once those are done, keep the dinner music playing quietly for the rest of the party. This gives a nice backdrop to conversations that non-dancers will want to have. They won’t need to ever put on the headphones. But for the people that might want to dance, but also want to talk, we recommend that they wear the headphones for dancing, and set them down on their neck with the volume still up for conversations. With the headphones on their shoulders, they will hear the songs they might want to dance to at a low volume. This doesn’t interrupt the conversation. Then they can put on the headphones and take to the dance floor at a moment’s notice. Quick exchanges while dancing can be accomplished by just lifting one earpiece without losing a beat. Without Silent Disco, the older generation would flee from the loud-unfamiliar music half-way through the event, now they stay and enjoy themselves so much more! The parents now have the option of dancing or talking and the music that is playing is stuff that they know and like! See my blog post about communication with headphones on for more insights. The kids are having the time of their life listening to their own music at their own volume and never getting kicked off the dance floor by song requests from their elders. Rent your headphones from us here at www.silent-disco-rental.com and we’ll help you have the Mitvah party of a lifetime where there is music for every generation, all at the perfect volume! How will I communicate with my friends if they are wearing headphones and dancing to a different song? How will I talk to my friends at a Silent Disco Party? This is the first question everyone asks when they learn they will be wearing headphones. It is a natural concern because connecting with friends is the primary reason that parties even exist! This article will show you how conversation and connection potential is actually increased by the presence of the headphones. #1) Short exchanges are easier with Silent Disco headphones. You can lift one side off your ear momentarily. You hear what your friend is saying quite clearly, respond and put the set back over your ears. You don’t miss a beat, you don’t lose the music, you don’t lose the mood and you don’t have to shout over the loud music from traditional sound systems. People who have not tried it fear that removing their headphones will be the equivalent of going outside of the party room to talk. You don’t have to leave the room or even stop dancing. You control how much the music volume is reduced by controlling how far you lift the headphones off your ears. It is very easy to balance the volume of the music with your ability to hear your friend. The music can be as loud as you want it to be. With just one hand adjusting the earpiece on one side, you can literally talk and dance at the same time. You say, “Yeah, but you still have to get your friend’s attention in order for them to lift up their headphones.” That is true, but when are dancing to traditional speakers that are turned up as loud as dance music needs to be, can you really talk to your friend without first getting their attention? You have to pull them close and lean toward them before they can hear your words. At a dance that is powered by loud speakers, you have to deal with the disadvantage of the music remaining at full volume while you try to talk (or yell to be heard). If the dance is powered by headphones, you can speak at a normal conversational volume with your friend because the loud music immediately turns down as you pull the earpieces away from your ears. This makes verbal communication easier and of higher quality when the party uses Silent Disco equipment instead of traditional loudspeakers for the music. #2) Long conversations are easier and you can still listen for your favorite song. First of all, with traditional loudspeakers at peak volume, extended conversation requires lifting your voice to the level of the music. This can get uncomfortable after awhile, which either shortens the conversation or causes you to step outside of the party room to continue. At a Silent Disco Party, extended conversations are effortless. If you don’t want to miss your favorite song during the conversation, keep the headphones resting around your neck instead of removing them entirely. Leave the volume on and you can still hear the music coming from the headphones. It is quiet enough to not disturb your conversation, but it is completely audible. You are enjoying higher quality extended conversations because you are not yelling over loudspeakers. You can still jump onto the dance-floor the minute your favorite song comes on because you can still hear the music from the headphones around your neck. #3) Non-verbal communication is better because of the headphones. One of the reasons for loud music is to get people to dance. Dancing is 100% body language. Dancing is the ultimate non-verbal communication. But the Silent Disco’s three-channels-of-music option introduces additional opportunities for non-verbal communication that are incredibly delightful and unique. The first is gesturing to your friends that they ought to be listening to the same channel you are listening to. They will be doing the same to you and it adds a simple-unspoken-but-hilariously-fun exchange to the whole activity. From there, in order to decide whether you want to switch to their channel, you are watching them do the dance motions to their song. You are trying to guess the song they are listening to while you are listening to a completely different song. This is a whole new level of non-verbal communication that is so much fun, you will just start laughing in spite of yourself! #4) Connection is the same even if your friends are dancing to a different song! 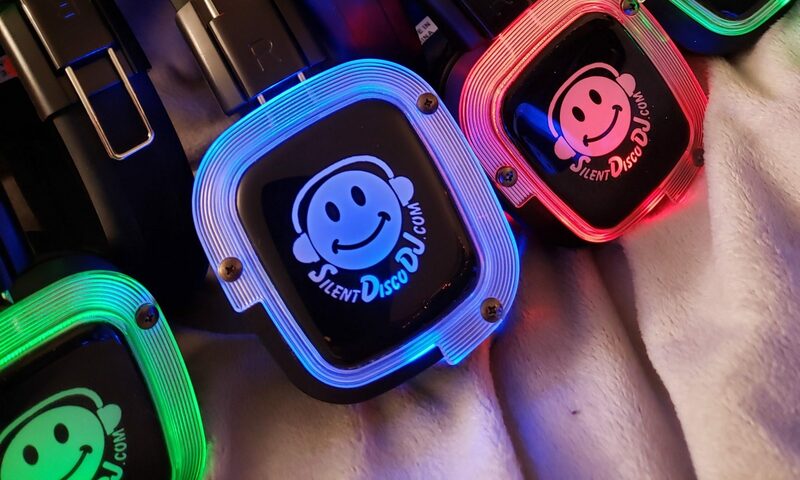 All of the Silent Disco headphones we have for rent allow users to select between three different channels which in turn allows your fellow dancers to listen to different songs than you are listening to. You can still dance with your friends even if they are listening to a different song! We already talked about dancing being a form of body language and a form of non-verbal communication. But, if Silent Disco allows us to dance together while each listening to a different song, are we still communicating and connecting through our body language? When you are dancing with your friends, is your body language reciting the lyrics? No, your body language is saying, you are my friends and I like dancing with you. That message does not change as the song and the lyrics change. The tempo will change with a different song. When you mime something from the lyrics, that will change with a different song. #5) The uniqueness of Silent Disco gives you more to talk about. Watching people dance without audible music never gets old! That alone is enough to stimulate twenty conversations! As a culture we are very accustomed to hearing the music that our friends are dancing to. Silent Disco has taken that conditioning and turned it upside down. It is new, it is exciting, it is funny, it is weird, and yes, it gives us something to talk about! You are worried that wearing headphones will make it harder to talk with your friends, but paradoxically, the opposite is true! Whenever friends share a new experience it draws them closer to one another. They communicate and connect more because of that experience. The fact that Silent Disco is new and unusual increases how much you will talk to your friends about it. But Silent Disco is not a try-it-once-and-never-again type of activity. Time and time again, I hear from people who go to Silent Disco parties over and over again. They tell me that there is nothing more fun! There are more opportunities for connection and communication at a dances powered by Silent Disco headphones than there are at a dances powered by traditional loudspeakers. A) You can talk easier and quicker on the dance-floor by lifting up an earpiece. B) You can talk easier and longer while not missing anything by setting the headphones around your shoulders so the music is still audible. C) Body language between you and your friends is increased as you interact with each other over the three-channels of music. D) Connection between friends is maintained even if you are not listening to the same song. E) Communication between friends is increased because you are sharing the unique and unusual aspects of the Silent Disco together. Get ready to connect like you never have before at your very own Silent Disco Party. Consider renting your equipment from us at www.silent-disco-rental.com. What is the best way to build your Silent Disco Playlist? If you, like most people who rent our headphones, are using phones or tablets to DJ with and are running three simultaneous playlists from Spotify, iTunes or similar services, this article will help you to choose which songs to put on your playlists. If you are a live DJ or manipulating your playlist during the party, these same principles apply. What is the single most important thing to consider when choosing awesome music for your party playlist? Play something that your guests know on all three channels. We recommend assigning each channel a general genre as a guideline. This makes it easier for the guests to stay in the mood. It helps them to keep the channels straight in their heads and it helps the playlist creator/DJ’s to keep from repeating songs from channel to channel. Let me give some perspective from a traditional DJ dominating the room with loud speakers turned up to eleven. When a DJ is using a traditional sound system, they have the benefit of being the only music in the room. The listeners don’t have the option of switching to a different channel. This gives the DJ more leeway in song selection. If listeners don’t care for the song, they may leave the dance floor, but they are not going to turn it off by switching the channel on their headphones. This is THE game changer that is driving the rapid rise of Silent Disco as a party medium. Suddenly it is up to the listener instead of the DJ to decide what song they are going to listen to. When you look at it that way, it is no surprise that Silent Disco is so popular! It is the same model we’ve seen on TV and radio. Thanks to the Internet and streaming services we all expect to be able to choose our own media. Why should it be different at a party? But even a DJ with a traditional sound system needs to play something the crowd knows if she wants to be asked back again. It is a rare club where the DJ can get away with playing unknown music and be able to keep people on the dance floor while doing it. But with three channel Silent Disco parties, it is important time three to play something the crowd knows, because anything else is simply ignored by judicious use of the channel sector switch. You’ve got to understand that the mind of the partying listener is always wondering what is on the other channels. They are always worried that they might be missing an awesome song that is playing right now! So they switch channels every 30 seconds. And when they do, you have only moments to capture them. If they land on your channel during that boring instrumental part, they are gone to the next channel. Hint: If you are DJ’ing live for Silent Disco, queue up past the boring instrumental part! If they land on your channel while it is playing a song that they don’t know, they are switching channels. You’ve lost them to your channel (for at least thirty seconds). There are several ways to “Know” a song. You could know the melody and the beat. It is even better to know the words to a song. The ultimate best way to know a song is to know the moves too! A perfect example of a song with awesome moves that everybody knows, is the song, “Shout.” Yes, it has fantastic opportunities to sing the words back to the performer (or DJ), but it is those classic dance moves drive that song over the top! Anyone who sees those dance moves, even if their headphones are set to a different song, knows what song those people are dancing to. If that song is not on your list – you are missing a huge opportunity. Now “Shout” is a superstar on the list, but there are a gazillion others that are far more subtle. Examples are any songs that ask you to do anything with various body parts. If it is not in the lyrics, it might be from a music video or movie soundtrack. Gangnam Style is an example of how a music video can create moves for a song. We don’t even know what many of the words are, but it was the moves in the music video that made the song memorable. It was those same moves imitated by dancers that made the song so much fun on a dance floor. Everybody knows how much fun it is to sing along to a pumpin’ song and it is even more fun to be singing and doing the moves in perfect time with your friends. Nothing could be better! So choose songs that have memorable lyrics and moves. Play songs that they ALL know! The bests songs are songs that everybody at the party knows. If you play a song that only half of your guests know, and follow it with a song that all of your guests know. The latter will be more fun even if it is not near as good of a song. Let me say that another way. The quality of the song matters less than the number of people who know it. Play the best song ever written -but known by few, and your dance floor will be empty. Play a sub-par song – but one that everybody knows, and your dance floor will be packed! One last word: It is tempting to allow a friend with a phone to run their playlist for awhile. We caution you to first take a look at what they are about to play. If she has a list of awesome songs -that not a majority of your guests know by heart, don’t let them use it. Your party is NOT the place to promote obscure music or to enlighten your friends about the newest songs. Your party is for having fun. Your party is for bringing people together in a celebration of life. There is only one way to do that.